A new campus, a landscape for learning. 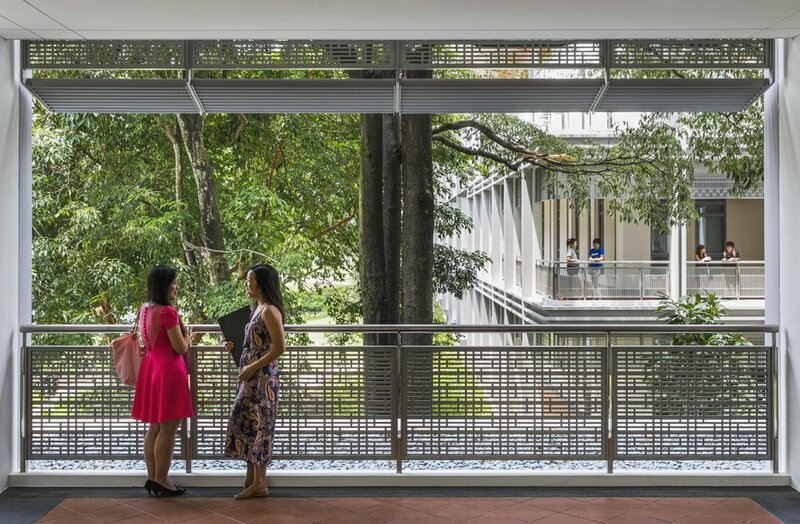 Throughout the process of design, the strategy for the Yale-NUS campus landscape was guided by a single motto: “a campus in a garden, a campus of gardens.” This campus—as an ecosystem and a collection of plants and spaces—was to be much more than just a backdrop for the new liberal arts college. It was expected to be a teacher, an archivist, and a “caretaker” in its own right. Gardens play a key pedagogical role, at YNC, as a “learning landscape.” Together, these were planned as an arboretum—a common resource that would be central to the educational experience. It is a collection of shrubs and trees that are organized in careful assemblages that relate them ecologically and thematically. Species are identified by signage throughout, which is intended to share with visitors a collection of inter-related stories. Together, these describe the natural and cultural history of our island city. Space is here understood as a series of interpretive opportunities, which bring the residents into a thoughtful, educational relationship with their surroundings. The arboretum provides a unique environmental theme for each of the campus areas, and proposes a collection of related species, as well as an interpretive framework for each. The large central Campus Green is designed as an “evolved tropical landscape”—creating a lush, multi-tiered landscape from local and regional plants. This demonstrates the trophic structure of the equatorial forest, and features six heritage trees that were painstakingly conserved throughout the construction process. The Residential Colleges each have a unique courtyard garden, with a focus on plant types: Productive Species, Palms and Cycads, and Significant Regional Specimens. These included trees and shrubs used in folk medicine or in agriculture, as well as those that are considered symbolic to the region’s cultures and religions. At the same time, the campus design also plays a hydrological role, serving University Town more generally. 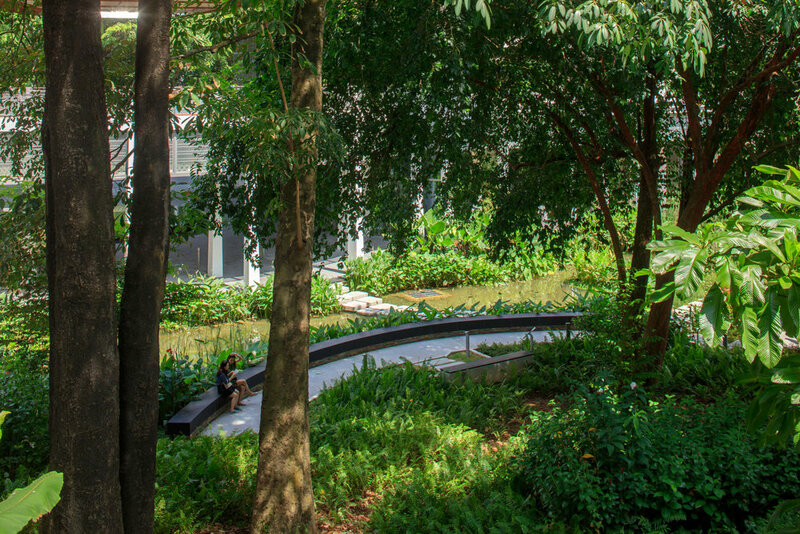 An eco-pond has been designed within the Campus Green. It works alongside a system of bio-swales, to remediate storm-water. Together, these have the capacity to filter a proportion of U-Town’s runoff. At the same time, these amenities are made visible and explained through signage, to teaching the public about Water Sensitive Urban Design (WSUD). 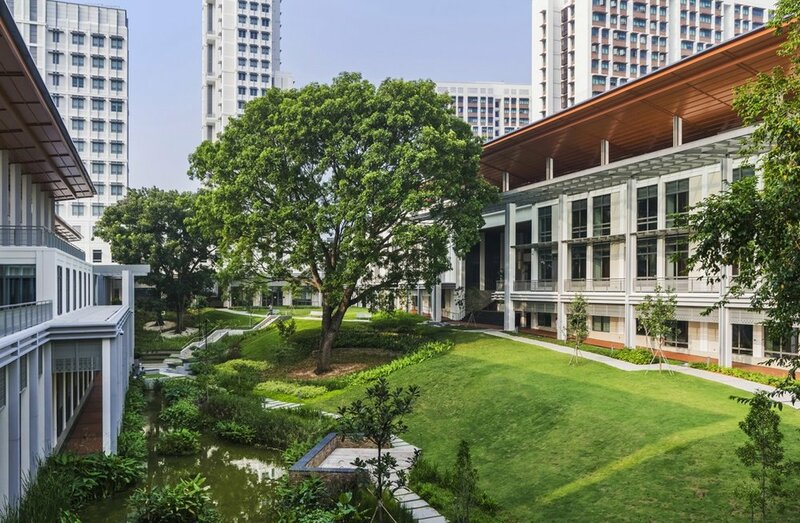 The campus received the Green Mark Platinum Award from the Building and Construction Authority in 2013, and was the first educational institution to receive the Landscape Excellence Assessment Framework (LEAF) certification in 2014, from NParks, Singapore.